METHOD: In the absence of a standard measure, a financial literacy index was constructed for the country using data collected on attitudes (towards), access to and use of financial services over the period 2005-2009. 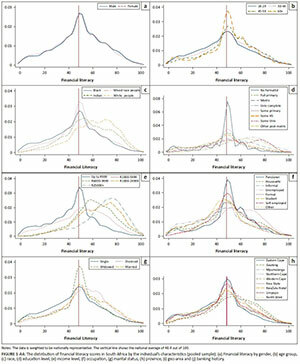 In a multivariate regression analysis, we used the index to examine the extent to which differences in financial literacy correlate with demographic and economic characteristics. The theoretical underpinnings of financial literacy are mixed. Development psychology theories (psychoanalysis, psychosocial and cognitive psychology) posit that financial literacy is not learned but is shaped by one's upbringing (which shapes one's personality), emotions and interactions in life (Erikson 1980; King & Levine 1993). The exchange theory, on the other hand, argues that the level of financial literacy will depend on the level of knowledge exchange and interactions among individuals. Knowledge diffusion is therefore more likely in high-density population areas (see Robson & Labner 2006). Implicit in this is the learning process, either from colleagues or on the job, while engaging in day-to-day financial activities. In the spirit of the learning theory (see Goldhaber 2000; Pavlov 1960), financial literacy is linked to habit formation, whereby reinforcement or punishment determines continuity of action. An individual can therefore learn and master financial skills if he is positively rewarded. All these arguments can be summed up in the capability theory advanced by Nussbaum and Sen (1993), that an individual's capability is a combination of personal capabilities (e.g. cognitive ability, personality traits) and external factors. The absence of external support can inhibit individuals' financial performance even when they possess the relevant skills. Empirical work guided by these theories and summarised in Lusardi and Mitchell (2014) shows that few individuals possess the necessary financial skills required to make decisions to save or invest and consume between periods. However, the definition of what constitutes financial skills, often referred to as financial literacy, is not standardised, leading to varied measurement of the same concept. Huston (2010) describes financial literacy as a form of literacy that relates to one's proficiency in making financial decisions. So, how proficient are individuals to draw up saving and spending plans? How is this proficiency distributed in a population? To answer these questions, we constructed a financial literacy index for South Africa for the period 2005-2009. Defining financial literacy as a composite of two domains, financial knowledge and financial capability, questions that fall in each of those domains were identified. These questions were selected from the FinScope3 surveys conducted on attitudes towards, and use of, financial services. We then used the Principle Component Approach to combine responses to these questions to obtain a score for each individual. This score was then used to investigate financial literacy differences across categories of the population and across regions. Using the proportion of correct answers to a set of three questions, Lusardi and Mitchell (2007) found that in the USA financial literacy is low among women, the young and the old. They also found that financial literacy is positively associated with income and education attainment. However, in Germany, Bucher-Koenen and Lusardi (2011) found no significant difference between the financial literacy levels of men and women using the same measure. They report, however, a stark difference between the financial literacy of individuals in the eastern and western regions of the country. A similar regional finding is reported by Fornero and Monticone (2011) between the northern and southern regions of Italy, and in the northern half of the USA compared to states located in the eastern and southern parts (Bumcrot, Lin & Lusardi 2011). In the USA, the regional differences are reported to be correlated with a state's poverty level. Klapper and Panos (2011) attribute the higher financial literacy levels exhibited by urban dwellers in Russia compared to their rural counterparts to the high number of interactions and hence knowledge diffusion in areas of high population density. Racial differences are also evident. For example, Crossan, Feslier and Hurnard (2011) found that the Maori group in New Zealand have low levels of financial literacy, as do Hispanics in the USA (Lusardi & Mitchell 2011b). Both these racial groups are part of the minority groups in these countries. 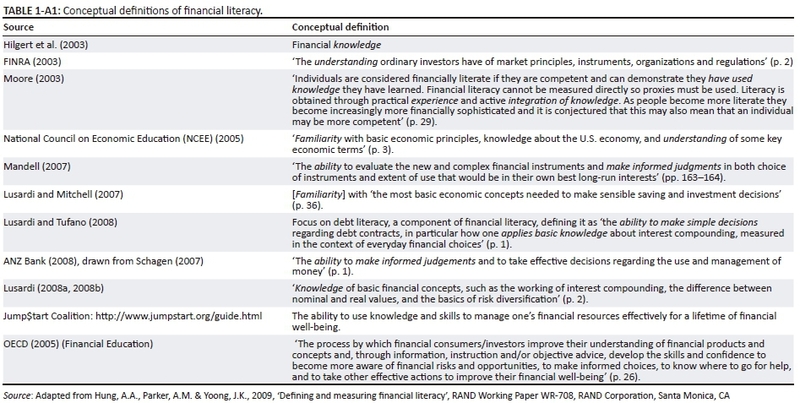 We adopted a combination of the definitions of financial literacy of Atkinson et al. (2007) and the OECD (2009) to align it to South Africa's financial sector characteristics. There are two financial literacy domains: financial knowledge and financial capability. Questions aligned to these domains were identified, the individual responses computed and the average scores cross-tabulated with demographic characteristics of the population. Principal component analysis (PCA) was then used to construct a composite index from the two domains as advocated by the OECD (2009). This allows for the profiling of the population using the average score of the index. Finally, regression analysis was used to investigate the determinants of financial literacy. Regarding financial knowledge, the emphasis is on the understanding of financial concepts, financial institutions and financial regulations. 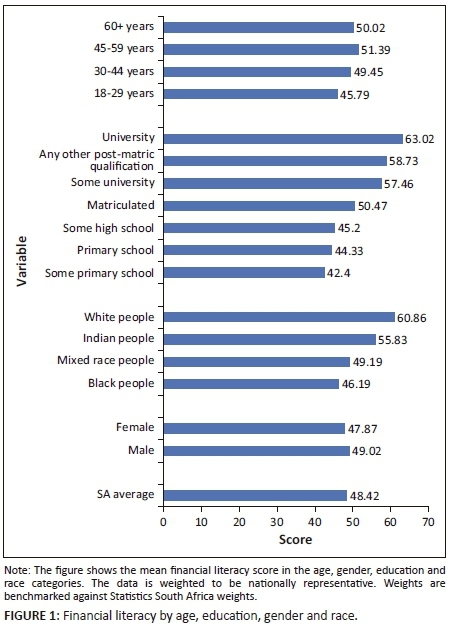 In the South African context, such data have been collected in the nationally representative FinScope surveys that have been conducted regularly since 2002.6 These data are collected using face-to-face interviews with individuals. We made use of the data collected on attitudes (towards), access to and use of financial services over the period 2005-2009.
where FLXi is the financial literacy score for individual i, Qij is the score in domain j for individual i, Qj− is the sample mean, Sj is the sample standard deviation and Fj is the eigenvector of the first principal component weights. The scores were re-scaled through a linear transformation for ease of interpretation. Analogous to socio-economic status indices, the higher the score, the higher the implied financial literacy level of the individual (see Vyas & Kumaranayake 2006). For example, on a 0-100 index, an individual scoring zero has a financial literacy of zero (financially illiterate) while a score of 100 is equivalent to a financial literacy level of 100 (financially sophisticated). 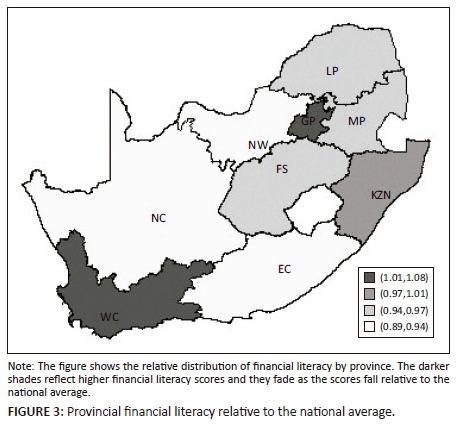 Thus the financial literacy profile of South Africans is obtained by comparing the mean financial literacy scores across the socio-economic and demographic characteristics of individuals in the sample, and weighting the data for national representativeness. The weighted descriptive statistics are provided in Table 1. The pooled data showed a slightly higher proportion of women (52%) compared to men (48%). Black people made up almost 80% while the rest of the population groups made up the remaining 20%. The majority of the sample had some high school education (40%) and was 18-29 years old, while the oldest respondent was 92 years old. More respondents were interviewed in urban areas (57%), with a regional distribution in favour of Gauteng, KwaZulu-Natal, the Eastern Cape and the Western Cape. Twenty-seven per cent of the respondents were formally employed, followed by pensioners and the self-employed. About 60% of the sample earned a personal monthly income of less than R1000, with 16.5% grant recipients, and in some cases individuals held more than one job. The average household size was four. The data were weighted using the Statistics South Africa weights as benchmarks. This sample is therefore nationally representative of the major population groups of the country and is balanced in terms of gender and region. Table 2 shows the proportion of affirmative responses to the domain questions. Panel A shows that about 44% of the respondents reported knowledge of 'bad debt', 11% knew about credit bureaus, and only 2% knew about the National Credit Act (NCA) even though these terms are closely related.7 Knowledge of budgeting and interest rates was low, and respondents admitted to not trusting banks. About 24% claimed knowledge of how to use savings, insurance and investment products. On average, respondents scored five out of nine points (see the sample average shown in Appendix 2), while almost one-third scored between zero and four points. 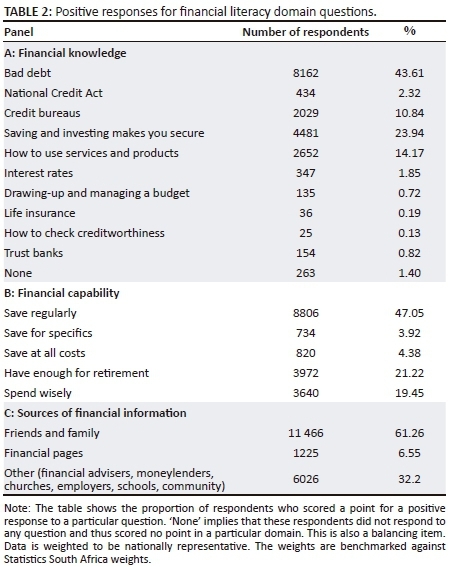 A key element in this domain is the source of financial information used by consumers.8 The majority of the respondents reported using 'friends and family' as a source of financial information, while 'financial pages' are rarely used (Table 2 [Panel C]). 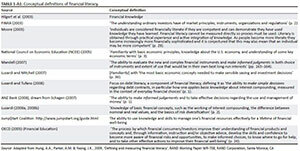 Notice that if only one domain was to be considered as a measure of financial literacy (see Hung, Parker & Yoong 2009, for example), South Africans would be more financially literate using the knowledge domain than using the capability domain, going by the average score in each of these domains. Similarly, using the 'Big Three' as in several studies (see Xu & Zia 2012) would make the picture even worse, since only 1.8% of the sample reported knowledge of the interest rate concept while 23.9% reported knowledge of saving and investment (Table 2), which is akin to the concept of a compounding interest rate. The constructed financial literacy index combines the domains into a score that ranges between 0 and 100, with a mean of 48.4 (Figure 1). Overall, the index follows a normal distribution, with the majority of South Africans around the country's mean. But the densities become flatter and fatter for any shift to the right of the national mean, implying that there are few financially literate individuals, and that those who are literate had very high scores. 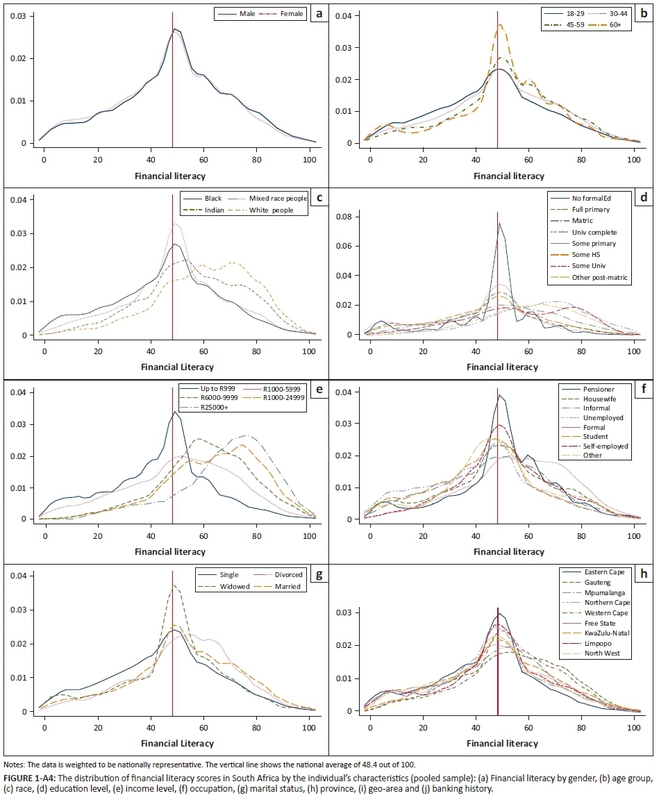 Appendix 4 shows the density plots for within in-group differences in financial literacy by various categories.9 There is no visible difference in the distribution of financial literacy scores by gender, age group and geo-area. There are, however, substantial differences in the distribution by education, marital status, personal income and race. Higher income and education levels are associated with a shift to the right of the country's mean, reflecting above average financial literacy. The distribution for white and Asian people is also skewed to the right, while distribution for black and mixed race people is skewed to the left. To obtain a clearer view of the distribution, the with-in categories mean scores are provided in Figure 1. Lower than average levels of financial literacy are evident among women, black South Africans, those with less than matric (high school), and those in the age group 18-29 years. This pattern is similar to those reported in studies for upper-middle income economies such as the USA, Europe, Japan and New Zealand, as well as for low-middle income countries such as India, Indonesia, West Bank and Gaza (see Xu & Zia 2012 for a summary). Lusardi, Mitchell and Curto (2009) and Johnson and Sherraden (2006) found similarly low levels of financial literacy among youths in the USA. Financial literacy is high at higher levels of education and for individuals older than 30 years of age, tapering off slightly at 60 years. This finding follows the inverted U-shape reported by Lusardi and Mitchell (2011a), Xu and Zia (2012) and Jappelli and Padula (2011). According to Jappelli and Padula (2011), this is evidence of a decline in cognitive ability in the latter years of an individual's life. The descriptive statistics show a positive association between financial literacy and several economic, demographic and geographic characteristics. However, there is a possible correlation between some of these characteristics themselves, for instance, province with race, and province with the rural dummy. To tease out the effect of each of these variables holding others constant, we conducted multivariate regression analysis. The dependent variable was the index of financial literacy, which was a continuous variable. 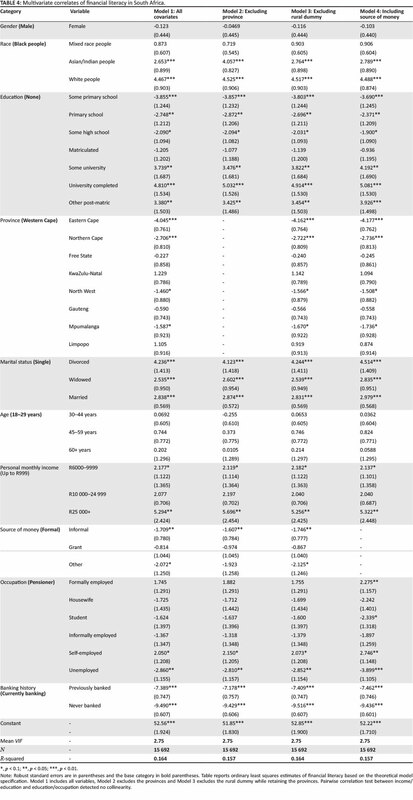 Model 1 (Table 4) reports the estimated coefficients for a specification that includes all possible controls, as used in similar studies such as that by Lusardi and Mitchell (2014). Models 2 and 3 are specified to tease out the correlation between provinces and the rural-urban effect. Results reveal that compared to black people, the levels of financial literacy of white and Asian people are higher in all specifications and that this difference is statistically significant. 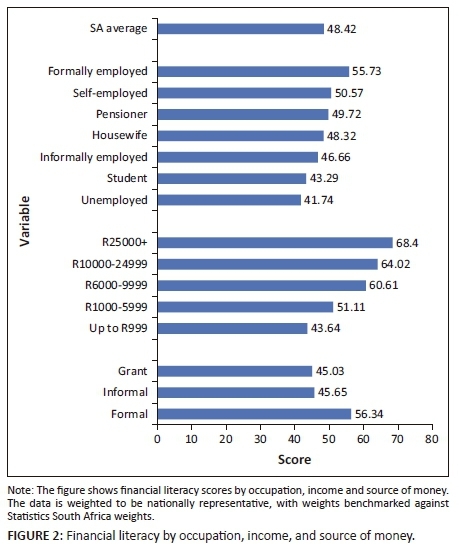 Similarly, education levels above high school level (matric), income levels above R6000, as well as being divorced, married or widowed are positively correlated with higher financial literacy scores. Significant racial influences have been reported by Bumcrot et al. (2011) in the USA, Crossan et al. (2011) in New Zealand, Alessie, van Rooij and Lusardi (2011) in the Netherlands, Dragan (2011) in Bosnia and Herzegovina, and Xu and Zia (2012) globally. The effect of marital status might in part reflect the nature of marriage contracts in the country or, as Hsu (2011) argues, strategic acquisition of financial literacy following separation from or the death of a life partner.13 A similar effect of education and income has been reported by Behrman et al. (2010). The argument is that individuals in higher income brackets can afford the cost of acquiring financial literacy and thus seek more financial knowledge to better manage their financial wealth. Although men were found to have higher levels of financial literacy than women, this variable is not statistically significant. This result can be compared to a similar finding reported by Bucher-Koenen and Lusardi (2011) for East Germany, where gender was not significant in relation to an individual's financial literacy level. Furthermore, despite evidence of the inverted U-shape pattern often seen in the relationship between age and financial literacy, the estimation results show no statistical significance of the age variable. 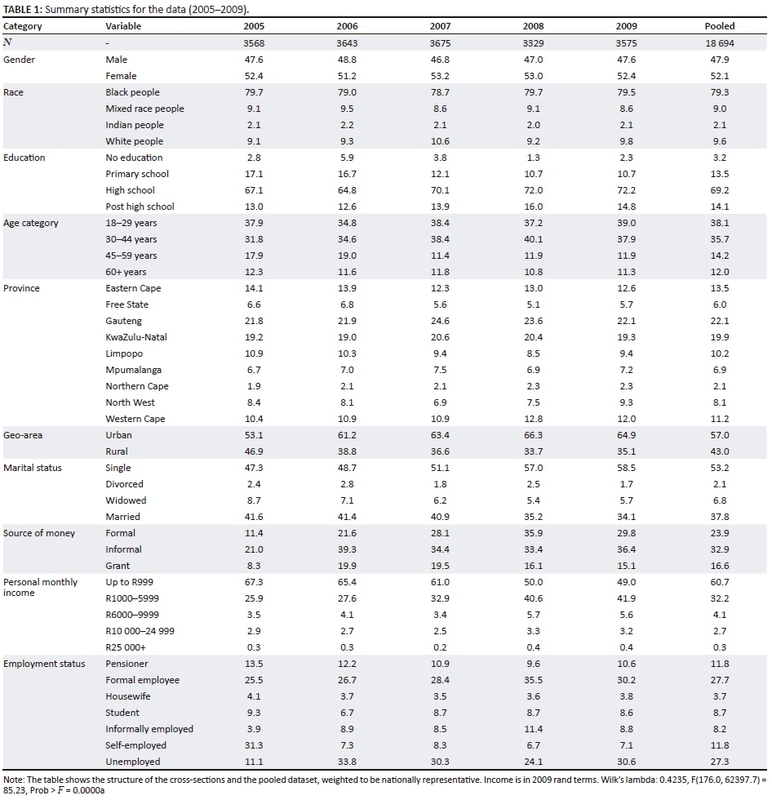 This result suggests that either age does not influence financial literacy in a South African setting, or that financial literacy related challenges cut across age groups. In this article, we provide a benchmark profile of financial literacy in South Africa following financial sector transformation in the country and increasing innovation in the financial sector. In the absence of a standard definition and measure of financial literacy, we use observational data and a quantitative approach to construct a financial literacy measure in the form of a financial literacy index. The variables used in the construction of the financial literacy measure are in line with the microeconomic framework of the financial behaviour and consumption-saving decision-making process of an individual. Our approach differs from approaches like the 'Big Three' and the subsequent 'Big Five' used in earlier studies, which focus on knowledge of interest rates, inflation and risk diversification as being synonymous to financial literacy. We also differ from studies that use the outcome-based approach especially in developing countries, where the possession of a formal financial product is considered to be a measure of financial proficiency. We argue that such an outcome-based approach might instead capture the extent of financial access, which in the South African context is plausible given the financial sector transformation process of the early 2000s. The results presented in this article reveal a national average financial literacy score of 48.4, and dramatic differences in financial literacy by key characteristics, using pooled data for the period 2005-2009. 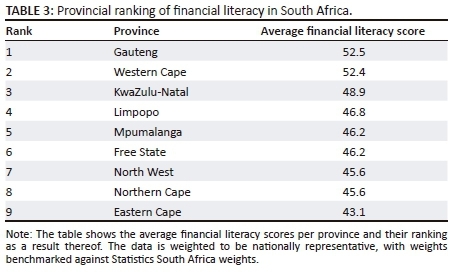 Below average financial literacy is common among women, young adults (including students), and individuals with less than matric (high school) education, black people, the unemployed, and rural dwellers. While urban dwellers exhibit above average financial literacy, this variable is not statistically significant in the case of South Africa. Similarly, even though there is evidence of an inverted U-shape in the association between age and financial literacy, age is not a statistically significant correlate. Education, income, geographical location, marital status and race are the significant contributors to the financial literacy of South Africans. However, the significance of geographical location is outweighed by the demographic characteristics. This implies that provincial variation in financial literacy can change in line with changes in these characteristics, resulting from provincial migrations and changes in economic activities, for example. E.L.N. acknowledges participants at the African Econometrics Society Conference in 2014 for their insightful comments, and funding from the Carnegie Foundation and the National Research Foundation. M.L. acknowledges the Research Chairs Initiative of the Department of Science and Technology and the National Research Foundation for funding his work as the NRF/DST Research Chair in Poverty and Inequality. E.L.N. 's PhD was funded by scholarships from Carnegie and the SARChI: Poverty and Inequality Research. This article is based on a chapter from E.L.N. 's PhD thesis, for which M.L. acted as supervisor. Both authors worked together to prepare the journal article, with E.L.N. contributing all data analysis and M.L. providing the contextualisation of the project and editing of the article. 2 . See for instance Muradoglu and Harvey (2012), Garcia (2013). 4 . Azerbaijan, Chile, Germany, India, Indonesia, Italy, Japan, Netherlands, New Zealand, Romania, Russia, Sweden, USA, and West Bank and Gaza. 5 . See Hung et al. (2009) for a summary of the measures. 7 . The NCA regulates formal credit transactions and it requires lenders to be registered, but knowledge of 'bad debt' could imply a bad experience with credit either from formal or from informal sources. 8 . For example, Lusardi et al. (2009) found a significant correlation between peers and communities as a source of information and higher levels of financial literacy among youths. 9 . All data are weighted by weights benchmarked against Statistics South Africa weights to make the statistics nationally representative. See Appendix 5 for the full set of decomposition results. 10 . Grants include child support, foster care support, care dependency, old age support, disability, war veteran, social relief of distress, and grant-in-aid. There are as many as 8 million grant recipients on average per year (www.sassa.gov.za). 11 . For instance, social welfare recipients in South Africa are paid through a bank account (see http://newsroom.mastercard.com/press-releases/ten-million-sassa-mastercard-cards-issued-to-south-africansocial-grant/), while this same group is targeted by moneylenders (see http://www.kayafm.co.za/moneylender-targets-social-grant-beneficiaries/). 12 . P0 is the head count poverty and P1 is the poverty gap. See Woolard and Leibbrandt (2009) on these and other provincial poverty measures. 13 . In South Africa, those married in community of property share equally in the wealth of the partnership. This includes financial obligations such as debt and investments. Thus married individuals are more motivated to learn about finances or to fall victim to the financial mistakes of their spouses - but only if they are married under this regime. 14 . This approach was used by Bumcrot et al. (2011) to isolate the effect of the demographic variables from the geographical variations in financial literacy in the USA.